Hello friends~ Birgit here with you today. I have a card that makes me think of walking through an English garden in spring. I started by cutting the Poppy Stamps Hampstead Corner twice, once out of green card stock and once out of white. I cut the leaves off the flowers of the white card stock and colored the flowers in lightly using copics, adding some pink pearl stickles to the centers and set them aside to dry. I then cut the Spellbinders Lattice out of white card stock and framed it using the outside frame from Impression Obsession All In One Frames ~ Rectangles 2. I adhered the lattice panel to the front of my card base and added the Hampstead Corner pieces to the corners of my card and glued the white flowers onto the corner pieces. The sentiment is stamped on an old scalloped oval that I think was from Quickutz but there are lots of beautiful scalloped oval dies available at Dies R Us. Today's Tip: Cut your dies out multiple times using different colors of card stock and trim different elements of the die, to layer your die cut images. It looks like you've used more than just one die on your project and adds great dimension. A very pretty card. The lattice makes a fabulous background, and the flowers look so real! Just beautiful Birgit! The color on the flowers is perfect and yes ... and English Garden is what came to my mine as well! Beautiful! Happy Spring all over! 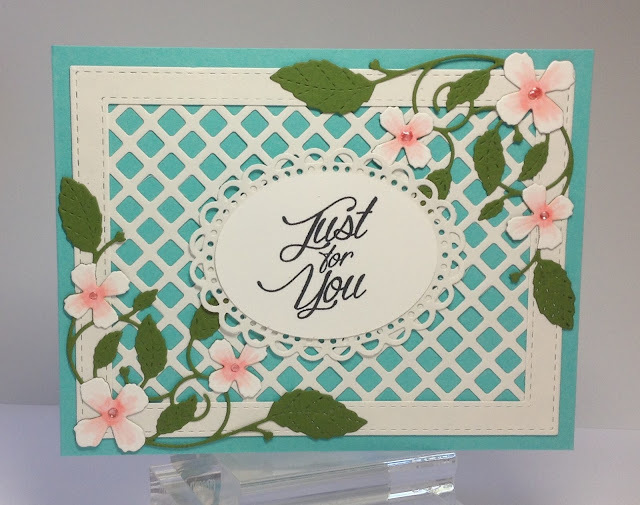 Love that lattice die cut, especially over that pretty blue card base, it POPS! The dogwood flowers and leaves are gorgeous, perfect coloring on your dainty flowers! Even the font on your sentiment on another delicate die is fabulous! WOW! Love this, Birgit! Isn't it neat when what you picture in your mind comes out perfectly on a card.........love these colors together. Beautiful card. Oh my that is just totally gorgeous, you did such an excellent job on those flowers! !